Renz Lou Lagria from Cordillera province emerged as the grand champion in KIX "R U Tough Enough" Final Showdown held last October 20 (Friday) at the Music Hall of SM Mall of Asia, and Lagria was hailed as the "Toughest Pinoy"! 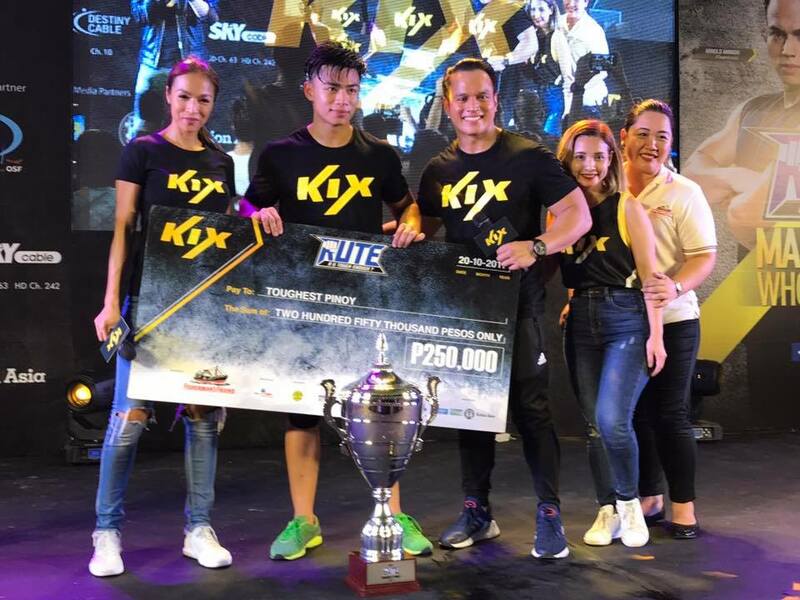 He brought home the grand prize of PHP 250,000. Five (5) male and five (5) female finalists battled it out doing rigorous challenges, finishing all tasks at the quickest possible time. The "R U Tough Enough?" final showdown was a first of its kind with an exciting battle of man versus woman. This is also the first year that "R U Tough Enough?" 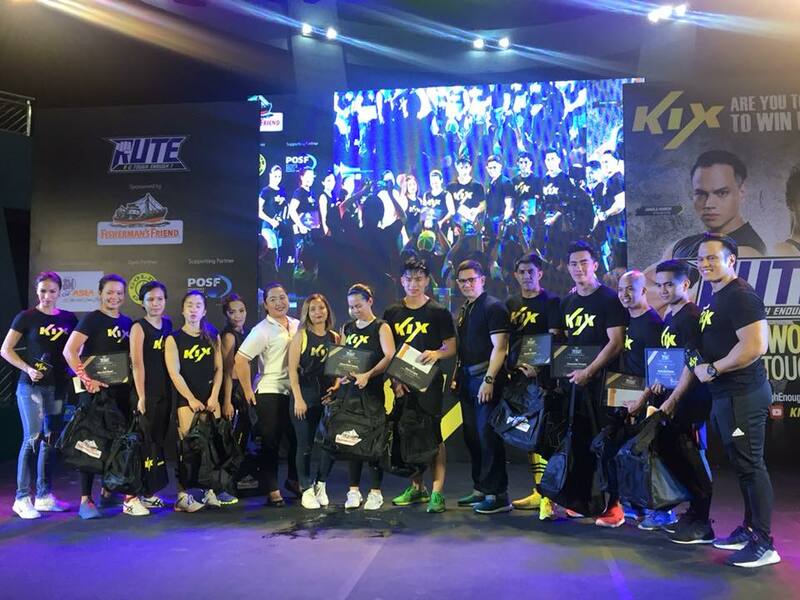 has a male and female ambassador, namely, Arnold Aninion and Aubrey Miles, who also served as the coaches of their respective team. 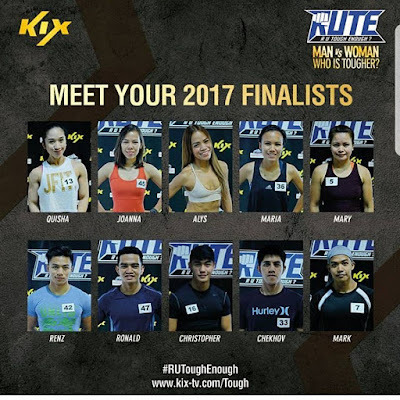 The anticipated battle of Pinoys and Pinays was surely a no easy feat, especially when the R U Tough Enough? final showdown is geared up with six (6) tough stations. It kicked off with the Perfect Storm, a challenge that is comprised of four sub-stations, built to rain on a fury of toughness. This was followed by the Z-Wall, a uniquely designed lateral climbing wall for uniquely strong individuals. Up next was the Bicycle Course, where biking will be given a challenging twist. The fourth challenge will be the Slip Wall, an inclined-wall made to test the inclined finalists. Next is the Total Recall, built to test the finalists’ physical and mental strength. Last on the lineup is the Fisherman’s Friend Panels Shuffle, where finalists’ will be coursing through hanging panels. With these difficult challenges, only the toughest Pinoy remained the last one standing. The female finalists of #TeamAubrey were: “The Girl Boss” Quisha Mediatrix Baterna, “The Relentless Challenger” Maria Rachelle Gallmann, “The Comeback Queen” Mary Jane Garner, “The Doubt Buster” Alys Andrea Serdenia, and “The Love Warrior” Joanna Marie Tantoco. The male finalists from #TeamArnold include: “The Goal Getter” Chekhov Agayo, “The Fitness Fighter” Ronald Jay-R Bolando, “The Public Protector” Christopher Dulagan, “The Fit-fluencer” Renz Lou Lagria, and “The Mighty Bro” Mark Anthony Jay Refugio.